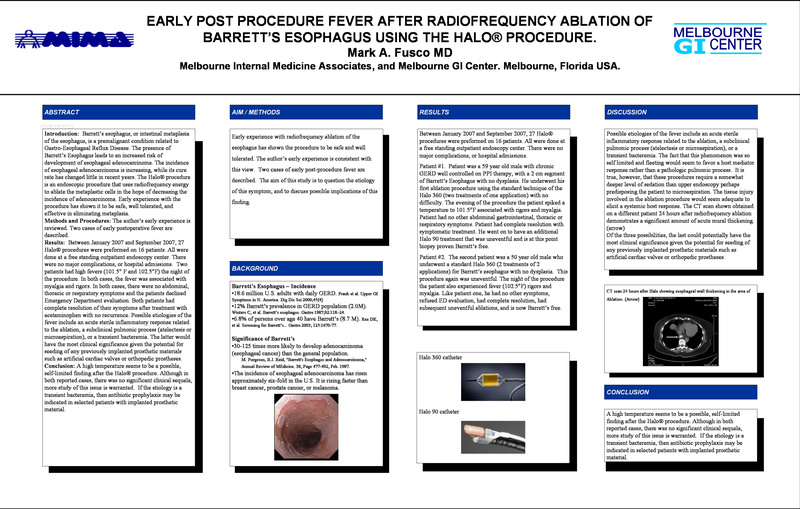 Early Post Procedure Fever After Radiofrequency Ablation of Barrett’s Esophagus Using the Halo® Procedure. Introduction: Barrett’s esophagus, or intestinal metaplasia of the esophagus, is a premalignant condition related to Gastro-Esophageal Reflux Disease. The presence of Barrett’s Esophagus leads to an increased risk of development of esophageal adenocarcinoma. The incidence of esophageal adenocarcinoma is increasing, while its cure rate has changed little in recent years. The Halo® procedure is an endoscopic procedure that uses radiofrequency energy to ablate the metalplastic cells in the hope of decreasing the incidence of adenocarcinoma. Early experience with the procedure has shown it to be safe, well tolerated, and effective in eliminating metaplasia. Methods and Procedures: The author’s early experience is reviewed. Two cases of early postoperative fever are described. Results: Between January 2007 and September 2007, 27 Halo® procedures were preformed on 16 patients. All were done at a free standing outpatient endoscopy center. There were no major complications, or hospital admissions. Two patients had high fevers (101.5° F and 102.5°F) the night of the procedure. In both cases, the fever was associated with myalgia and rigors. In both cases, there were no abdominal, thoracic or respiratory symptoms and the patients declined Emergency Department evaluation. Both patients had complete resolution of their symptoms after treatment with acetaminophen with no recurrence. Possible etiologies of the fever include an acute sterile inflammatory response related to the ablation, a subclinical pulmonic process (atelectesis or microaspiration), or a transient bacteremia. The latter would have the most clinical significance given the potential for seeding of any previously implanted prosthetic materials such as artificial cardiac valves or orthopedic prostheses. Conclusion: A high temperature seems to be a possible, self-limited finding after the Halo® procedure. Although in both reported cases, there was no significant clinical sequela, more study of this issue is warranted. If the etiology is a transient bacteremia, then antibiotic prophylaxis may be indicated in selected patients with implanted prosthetic material.